With the last of the formal events of the Ottawa Senators' season slipping into the rearview, the RBM crew got together one last time on a Google Hangout while they cleared their stuff out of the closets in their mothers' basements. "It's disappointing, obviously," admitted rookie blogger Joe "McLlwain's World" Boughner. "You never want to be the bloggers clearing out your stuff after the first round." Boughner denied a persistent rumour that he was battling a nagging back injury through the final stretch of games. "I'm just old and move slowly," said Boughner, stuffing a stale doughnut and a tower of empty Tim Hortons cups into a trash bag. "That's also the reason I'm not one of the finalists for Rookie Blogger of the Year in that Faces Magazine thing... too old." "Yea, that's the problem," muttered Mike Wheeler. 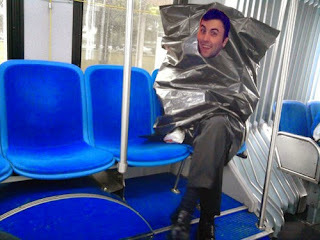 grossly misunderstanding what "Garbage Bag Day" means. "Eff you, Wheeler," replied Boughner before squinting his eyes and looking around his screen for the mute button. "I can't never find that danged button. Why do they have to make them so small?" For his part, Wheeler said his focus was on the future. "I'm bummed, sure, but I've got an entire external hard drive full of gifs to be used in extremely specific situations and half-written Tweets ready for next year," Wheeler explained. "I'm going to be... coming in hot... come training camp." "Get it?" added Wheeler. "Coming in hot! Like Bobby Ryan said that one time! Guys? Am I lagging? I don't think you can hear me. Guys? I said coming in hot! Guys? Oh look, there's my Wii U controller!" After what was considered by most to be a rebuilding year for the blog, even the elusive Matty Go Sens and Capital Gains took some time to right-click > Empty Trash on a season's worth of unused photoshops. "It's just time to get rid of some old ideas that never worked out," said Matty. "Like this cast photo of Home Improvement except it's Sens players. Actually, I'll probably keep that one." Gainsy was also getting in on the hard drive cleaning. "Time to trash some old stuff that I'm not going to use. Like this folder called just gold chains. Or this picture of Alf and Pikachu riding a surfboard except Alf is Eugene Melnyk and Pikachu is Stephane Da Costa and the surfboard is Alfredsson... Never mind, I'll definitely use this." Veterans like Steve On Sens, meanwhile, were plagued by questions about what their futures held. "I've loved my time here in Ottawa, no doubt," said On Sens. "But you get to a point in your career when you sorta want to see what else is out there. So we'll see." On Sens then appeared to be listening to someone slightly off camera. "I, uh, have to go to now. My mom says no internet after 8:30 pm on a school night. Someone tell Brochenski I won't be there for cold ones." While On Sens wondered about his future as a curfew-less blogger, fellow veteran presence Kevin Lee admitted his performance was hampered by injury down the stretch. "The doctors are calling it 'eye strain,'" said Lee. "Evidently you can get it by staring too intently at autographed sweaters on eBay trying to see if they're authentic." Lee then showed off a new pair of tinted sunglasses he was trying out to help cut down on the bright screen glare. Team captain Bonk's Mullet, asked about his team's early post-season exit, was contemplative. "We had a strong season at the keyboards, but in the end, we didn't get the key retweets when we needed them most. We ran into a hot Game of Thrones episode that took the crowd out of it early." Asked about the future of the team on the ice, Mullet continued. "We have a great leadership group surrounded by young talent. Pavs, Nik, and Z have really stepped it up since Lidstrom retired. -- What? Yeah, well of course I defected to the Wings. It's what great leaders do."